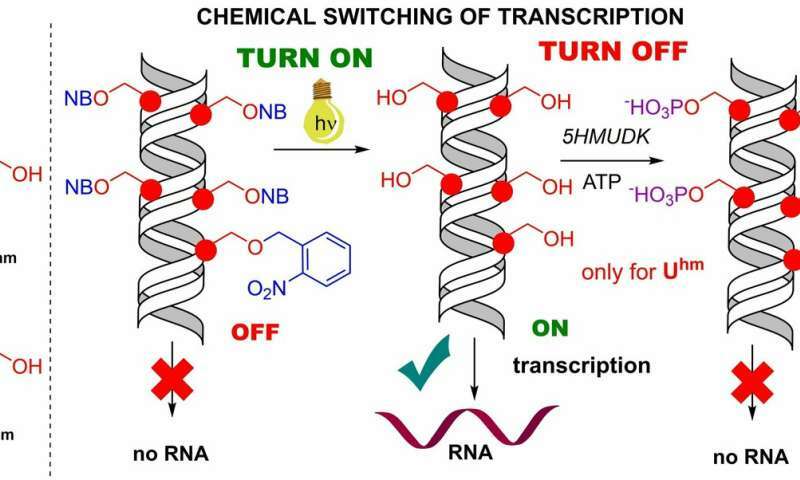 Researchers from the Czech Academy of Sciences and Charles University constructed an artificial chemical DNA switch and made the first step towards artificial epigenetics – targeted switching on and off of genes. Their paper was recently published in the journal Chemical Science. The genetic information contained in DNA is transferred during two consecutive processes separated both in space and time that lead to the formation of proteins. In the first process, so-called transcription, the complete information of one gene is transcribed to an RNA molecule, known as messenger RNA (mRNA), which in the second step serves as a template for synthesis of a specific protein within the cell during subsequent translation. Above this basic level of genetic information, however, there is another one, so-called epigenetics, that determines which genes are active at a given time and undergoing transcription to mRNA and which ones, on the contrary, are switched off and not undergoing transcription. This switching on and switching off is regulated by several mechanisms. One of the most important are chemical modifications to the DNA bases, i.e. DNA methylation and demethylation, during which a methyl group is added to or removed from a given location in the DNA. These very small modifications to the DNA regulate transcription to RNA and the formation of the respective proteins. A team of scientists from the Institute of Organic Chemistry and Biochemistry of the Czech Academy of Sciences (IOCB Prague), the Faculty of Science at Charles University, and the Institute of Microbiology of the Czech Academy of Sciences (IMIC CAS) headed by Prof. Michal Hocek and Dr. Libor Krásný have now used artificially prepared modified DNA to uncover the secret behind regulation of these epigenetic changes. In their previous article, the researchers published a surprising finding: modified pyrimidine nucleobases containing a hydroxymethyl group increase transcription with bacterial RNA polymerase. These hydroxymethylated pyrimidines occur naturally as minor bases in the genomes of some organisms. Now, however, the scientists prepared masked derivatives of these bases containing a special photoremovable protecting group, which results in the entire modified DNA being off from the standpoint of transcription. Following brief illumination with visible light (wavelength 400 nm), the masking groups are removed and transcription switched on. In the next step, however, it is possible to switch transcription off again by means of another reaction: the enzymatic phosphorylation of hydroxymethyl groups. So far, this new method of switching gene expression, which the scientists published in the journal Chemical Science, has only been demonstrated in vitro (in a test tube), and its application in living cells or organisms will require overcoming a number of other obstacles. To this point, the results have given rise to many more questions than answers, but they open the door to several new and interesting research paths. Currently, the most attractive of them is the hypothesis that this might be the mechanism by which bacteria effectively prevent transcription of virus DNA (through phosphorylation of virus DNA, which in some viruses is naturally hydroxymethylated) as well as the possibility of targeted regulation of gene expression, which would be time-limited. Having been modified in this way, the DNA would be switched on only for the desired length of time, and the natural instability of such DNA in the cell would prevent long-term adverse effects. Research in this area will continue, and in the future, it could lead to a significant breakthrough in understanding the mechanisms relating to how organisms regulate gene expression.